Chris Charla, head of ID @ Xbox, made one of the company’s more positive PR moves of recent weeks, and discussed a willingness to open the Xbox platform in the form of cross-network play. Though Charla did not mention the competition by name, I take the statement to mean PlayStation Network first and foremost. Forgive me for disregarding Nintendo’s current online efforts, perhaps the NX, which we’ll discuss soon, will seem more viable. The choice to utilise cross-network support is up to the developers, at least as far as bridging the PC, though it is important I feel, not to dismiss the contractual and legal concerns that I can only imagine must loom overhead. In addition to the technical ones; Street Fighter V, PS4 console exclusive, uses a separate Fighter ID to match PS4 and PC players through an in-game ecosystem. Microsoft’s Killer Instinct has the advantage of a single profile system across all Windows 10 devices, we’ll see the extent of its functionality on PC when it releases March 29th. Rocket League will be, I believe, the first third-party title to support Xbox-PC cross-network play; it already supports PS4-PC play. We’ve enjoyed masses of announcements from the big three hardware manufactures this last month or so, first with a wealth of Nintendo software chatter through Directs, followed by Microsoft’s half-baked policies. This week Sony comes to the table bearing hardware, specs, and a bunch of ‘games’. 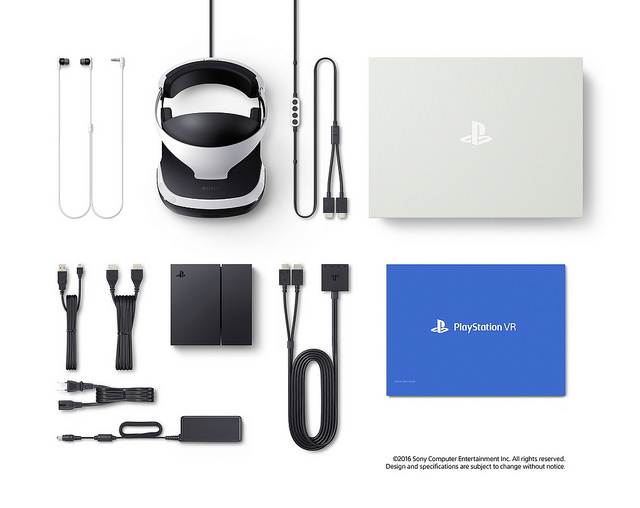 Sony held a press conference at GDC, in which they laid out the details of the PlayStation VR headset; it’ll cost £349, $399 (US), €399, $549 (Canada), and will require a PS4 and a PS4 Camera. With the optional addition of PS Move controllers, used in some games. The base bundle currently available for preorder contains; the headset, an external processor unit for "3D audio processing, Social Screen, and Cinematic mode”, headphones, and associated cables. Sony says they hope to release more than fifty games between the device’s launch and the end of the year, with over two-hundred-and-thirty developers, of all sizes, actively developing content. How large and rich those games are we’ll have to see, but the fact remains it is a meaty number, a hunk I can’t help but feel good about. The gaming world is in a very different place, its audience and market a wildly different shape than that of 2006, the launch of the Nintendo Wii. Nonetheless, I can’t help but wonder if Playroom VR and its early cousins could well prove pivotal in deciding the fate Sony’s VR efforts, perhaps even the mainstream acceptance of VR this time around. Kotaku continued to prove itself the dominant force of breaking videogame stories with a report from Patrick Klepek, on the existence of the “PlayStation 4.5”. According to the report, Sony has begun approaching and briefing developers on the device, which will they say; increase graphical and processing power, and enable 4K gaming. Sony of course declined to comment on the report, however, Klepek explained that other editors at Kotaku were able to confirm its existence through various other sources, some rather comical. Sony was reportedly giving briefings during GDC, check out Klepek’s report below for further detail. Fallout 4’s first DLC, Automatron lands on Tuesday 22nd, for £7.99/$9.99, included in the now more expensive season pass. The trailer below shows a diverse crop of robots, from Titanfall Spectre-esque leapers with glowing blade arms, to impractically bulky armoured behemoths, borne on dirt-churning treads. Though I missed it, Matthew noted that the Mechanist, the apparently villainous entity responsible for this robot uprising, appeared in Fallout 3’s Canterbury Commons. Sadly for me, Hellblade became irreparably entwined with Scalebound; both console exclusives, unveiled at E3, lacking any tangible sense of identity. As a result I’ve failed to keep up with either of them, until now in the case of Hellblade, now titled Hellblade: Senua’s Sacrifice. I still have no idea what the game is about beyond evident mental instability, but damn if that face isn’t expressive. There’s a chance SWTOR may be on a return trajectory to meaningful narrative content with next month’s new Knights of the Fallen Empire episode. Chapter XII, Visions in the Dark, appears to show a marked increase in core narrative, judging solely upon the parties shown in the twenty-five second trailer. While I enjoyed the previous two episodes, they failed to convey a sense of relevancy; I’m sure the Firebrand will play her part in the closing hours of Arcann’s reign, but treading water doesn’t even begin to cover it. Visions in the Dark releases April 7th. At long last Creative Assembly unleashed the gibbering hordes of the undead upon the waking world, and revealed the Vampire Counts faction in Total War: Warhammer, through a fascinating in-engine cinematic narrated by none other than Mannfred von Carnstein himself.